Douglas Ridge is more than just a development—it's a neighborhood, a community; a Sense of Place where people and families can come together with the confidence the high performance homes they build and live in are solid, green, highly-efficient, and healthy—built to last far beyond the average home today. Every home will meet or exceed 2015 IRC green fresh air and high performance house standards. All homes will be certifiable-ready if owner wishes to pursue LEED and other relevant certifications. They are all solar ready, should you choose. 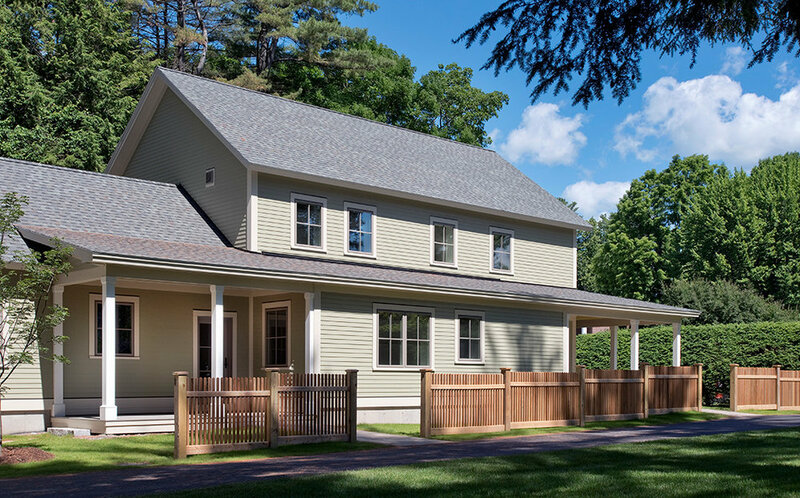 The land is convenient to I-95 north and south, yet surrounded by nature—with over 280 acres of conservation land abutting the development, and completely accessible to Douglas Ridge residents. A Sense of Place to call home. Welcome to beautiful Brunswick, ME, a coastal town and gateway to mid-coast Maine's magnificent coast. Brunswick offers a wealth of parks, trails, playing fields and open space. It is a livable community with a vibrant downtown–much to offer reisdents, businesses, students and visitors. Commutable to points north and south. Douglas Ridge is a green building development with a focus on space, privacy, healthy, highly-efficient, net-zero homes, and community. Located off Hacker Road, Brunswick, Maine, the convenient location offers easy access to highways for commuters and a plethora of conservation land immediately adjacent–teaming with steams, open space, and trails. This Tradd home model offers an optional porch, breezeway and garage. Many options are available to homeowners buying at Douglas Ridge. We chose UNITY as our preferred panelized shell builder for numerous reasons, not the least of which is their proprietary OpenBuilt®, OBGrid, Platforms. Unity components are built to last longer than any other builder’s, while maintaining sustainable, green, clean, healthy homes. Homes that evolve as your life unfolds. Beautiful, protected conservation land abuts the Douglas Ridge development, providing year-round enjoyment for our residents. Douglas Ridge residents have access by foot to over 280 acres of protected conservation land and trails. The conservation land immediately abuts the development and is accessible year-round for walking, hiking, running, snowshoeing, cross country skiing, and more. All Unity Homes are LEED certifiable, meaning that if a client chooses to pursue LEED certification, the home will qualify. Because the process of certifying LEED compliance can represent a significant investment of time and money, many clients choose not to pursue it. Unity Homes recently did a blower door test on a Xyla in northern New Hampshire to measure its air tightness—i.e., how “leaky” it was. The result was .38ACH@50 pa, which is well under the rigorous Passive House standard of .6 and almost seven times as tight as the strictest building code.